Following a trip to a local orchard with family and friends, I posted this funky photo on my Facebook page, and it wound up inspiring this month’s letter. I’ll kick it off with a quote by Benjamin Franklin, “The rotten apple spoils his companion,” popularly recast as “One rotten apple spoils the bunch.” Clearly, the disappointed look on my face stems from the sadness of selecting a rotten apple, a great surprise in an age when we expect to easily put our hands on an unlimited supply of perfect fruit at the grocer’s year-round. I rejoice that I was able to quickly move on to find many perfectly good apples that day, which brought to mind the question: Wouldn’t it be wonderful if it were just that easy to move away from a rotten situation in life and pick a good one instead? Our diet is a formidable place to start on improving how we feel, as Dr. Andrew Weil explains in Andrea Schensky Williams’ article, “America’s Evolution into Integrative Medicine,” on page 16.Then another metaphor surfaced. In life, there are bushels of opportunities to be a “rotten apple” with a poor attitude that can affect the outlook of others, just as ripening fruit that emits ethylene gas can quickly affect surrounding fruits. The challenge is to be able to remain, or consistently transition back to, being the good apple that everyone wants to be around. Remaining upbeat through life’s ups and downs must be something many people struggle with, given the wildly popular Positivity Challenge circulating on social media. If you are nominated to take the challenge and accept, you need to publicize three positive thoughts each day for a week and nominate likely friends to do the same. Recently a teacher asked if I would share copies of Natural Awakenings with a middle school English class for students to use in analyzing informational text as part of their article-of-the-week project. Mr. Petzak, I am honored to share this publication with young aspiring minds. To my new favorite class of eighth graders, I hope that you will continue to read Natural Awakenings as you grow to learn more about how everyone can work together to sustain the natural health of yourselves, your families and our environment. You and your peers are the world’s future and I’d love to hear any ideas or feedback you have. P.S. If you would like to share Natural Awakenings with students or customers, please email Publisher@NABuxMont.com. 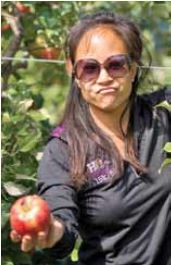 This entry was posted in DEPARTMENTS, Letter from Publisher and tagged apples, audrey chen, dr. weil, letter from publisher, lfp, october 2014 by Healthy Living Bucks and Montgomery Counties. Bookmark the permalink.